Is all the talk of holiday sales making your consumerist impulses all twitchy? ‘Cause Entertainment Earth has set it up so that you don’t have to wait until Black Friday to get great deals on some awesome geeky toys, collectibles, and more. Their Black Friday All Week Long! Sale is going on right now. 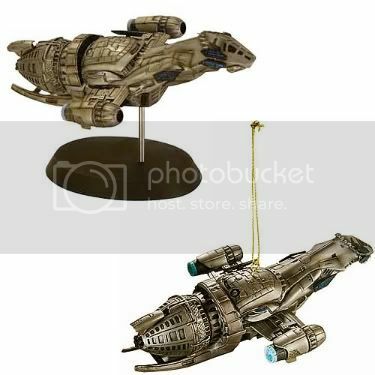 If the Star Wars Force FX Lightsaber Construction Set is still a bit too pricey for you, may I recommend the Firefly Serenity Ornament? It’s less than $10 (which is more than 70% off the price you’d pay for the same item on Amazon), and you’ll have the comfort of knowing that an illustrious and celebrated* blogger will be hanging the very same object of geek lust from his own Jewmachristmas plant of nondenomination. * It’s me… in case that was at all unclear. Visit the Black Friday All Week Long! Sale at Entertainment Earth. The ornament seems to no longer be available on the site. Wah! Geek Steal: 64% off The Wire Complete Series!